GLORY's environmental vision is captured in the slogan we adopted in 2010: "GLORY GREEN CHALLENGE: Leading the way for a prosperous Earth with dynamics and technology through cooperative efforts." 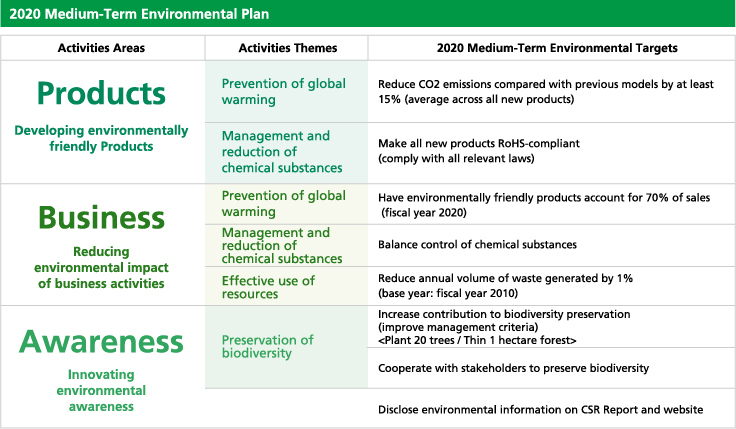 In FY2018, we established the "2020 Medium-Term Environmental Plan" as our three-year plan based upon our vision, and are working toward these targets. ● We will act in earth-friendly ways and endeavor to provide environmentally-conscious products with services that contribute to a sustainable society. We will comply with environmental laws and regulations, as well as the demands of our stakeholders. We will strive to reduce our use of energy and our emissions of greenhouse gases. We will strive to use resources effectively and will promote the recovery and recycling of our products. We will properly manage chemical substances and will reduce hazardous substances in our products. Each of us will strive to conserve ecosystems through activities that contribute to our communities. We will proactively carry out disclosure of information and will respond to the wishes of our stakeholders. In order to achieve this policy, we will set and work toward environmental targets and will strive to effect continuous improvements.